A Summers Day was created to run our legacy tours. We were established early 2017 with our debut tour, Bryan Adams, selling out 4 shows throughout New Zealand and are now based in Tauranga where we have has brought in some of the world’s more recognised artists. These artists include Bryan Adams, Toto, Dave Dobbyn, UB40, Dragon, Exponents and many more. We strive to continue to bring in artists that appeal - but not limited to - the older generation and put on shows to enjoy all time classical performances with some of the greatest entertainers over the last few decades. TOTO - The legends behind some of the most iconic songs in history - are set to tour New Zealand early next year. Presented by Neptune Entertainment and The Breeze, the TOTO tour will be the first-ever in what will be an annual summer concert series called ‘A Summer’s Day Live’, which will feature major international artists from the past four decades. 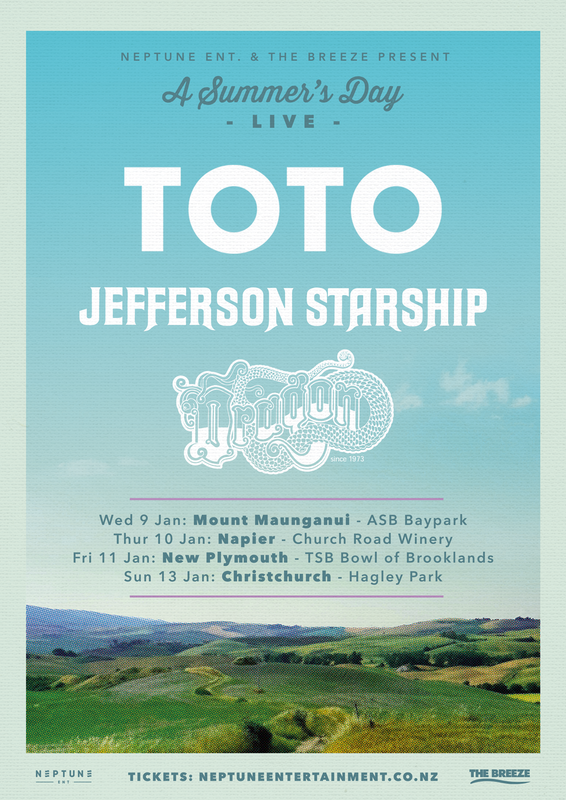 The concert series will see US act TOTO play shows at ASB Bay Park in Mount Maunganui on January 9; Church Road in Napier on January 10; TSB Bowl of Brooklands in New Plymouth on January 11 and Hagley Park in Christchurch on January 13. Kiwi favourites, Dragon, will support TOTO, with another exciting headliner still to be announced. This is an all ages licensed event.